Move over flat design, there’s a new design trend kid in town: the whimsical custom illustration! SaaS (Software-as-a-Service) companies have run with this trend in 2018, to the point where it’s now hard to find a software landing page that doesn’t contain an large illustration above-the-fold. Over the last few months, I have been stumbling on more and more of these landing pages that somehow all look unique and also kind of the same. We’ve come a long way from just showing screenshots of the software interface on the homepage! 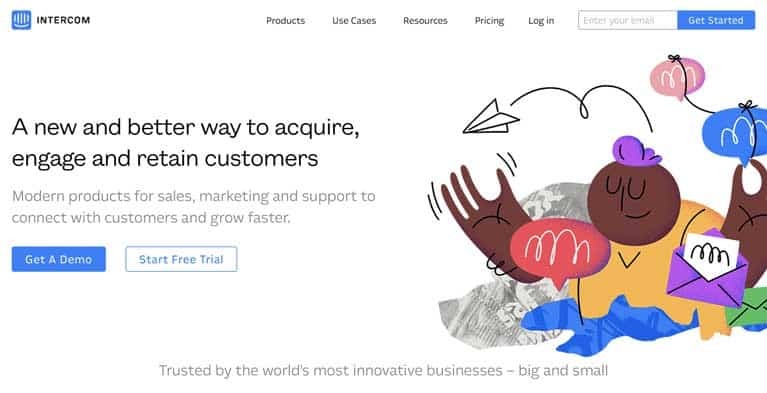 Here are 14 more SaaS landing pages that use quirky illustrations to convey their products. Basecamp was one of the first companies to kick off the illustration design trend. Archive.org first records a landing page with this illustration being rolled out some time around November 2016. 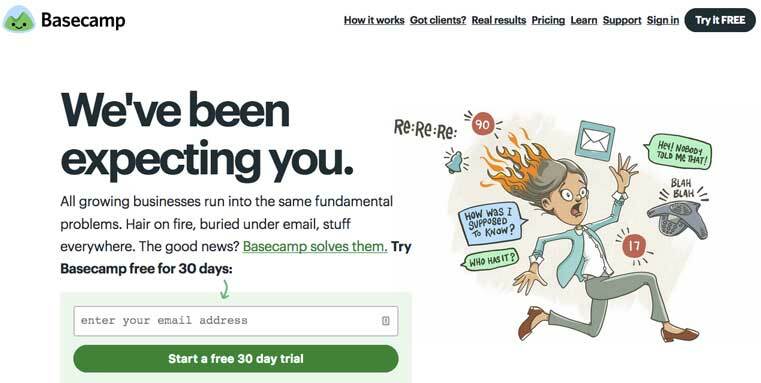 The “woman with her hair on fire” illustration is a very powerful visual metaphor for the problem that Basecamp’s software can solve (too many work messages). OptinMonster is marketing lead generation software. Their homepage illustration is very similar in style to Basecamp’s, but they’ve taken the creative decision to show the ‘before’ and ‘after’ of the product instead. Slack’s custom illustration is a lot plainer than Basecamp’s and OptinMonster’s. Instead of using a frantic character, they’ve gone for 3 calm and productive figures (of different sexes and colors) interacting with slack (a team messaging service). It’s a less eye-grabbing image, but quickly conveys the collaborative and inclusive nature of the product. 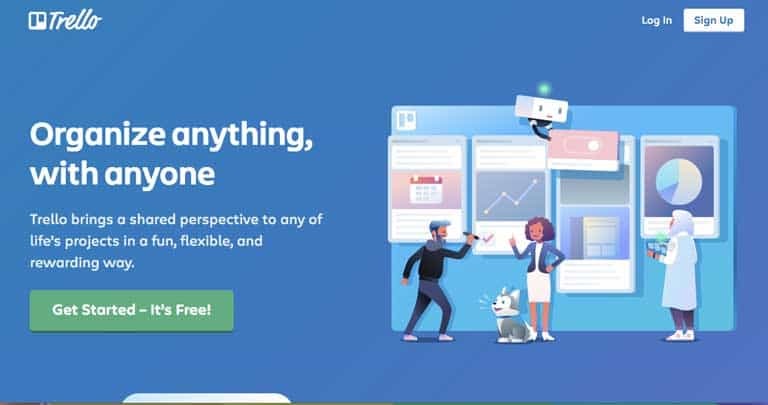 Like Slack, Intercom’s landing page also goes with serenity and productivity in its illustration, a brown (male?) figure confidently juggling multiple messages. It’s interesting how some SaaS companies highlight the “problem” their product solves, while others emphasize the “solution” angle. Intercom is the latter. Airtable’s illustration artfully depicts diversity among its user base with the colors pink, yellow and blue and represents a variety of sexes while it’s at it. 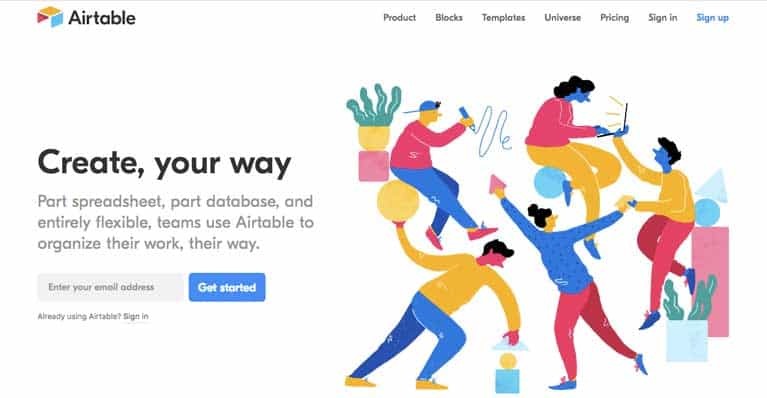 Airtable is yet another team planning/messaging SaaS company, so it’s no surprise that they’ve chosen to showcase their product on the homepage in a similar manner as Basecamp and Slack. You could be mistaken for thinking that Jira’s landing page (hosted on its parent company Atlassian’s domain) is from Slack or Airtable. You’ve got colorful people (check! ), mixed sexes (check!) and a lot of interaction with the product. I think Jira’s illustration runs the risk of being quite boring and not distinct enough to set it apart from the competition. Another of Atlassian’s products, Trello’s original graphic is not a world away from Jira’s hero illustration – a mixed group of people interacting with a stylized product interface. Trello does manage to convey more personality with its illustration; there’s even a dog (!) to let you know that you really can organize anything with anyone. If anyone has managed to get their dog to use Trello, please let me know and send pictures. Hootsuite is social media management/scheduling software. For some reason, the company chose to create an illustration of a cat and a dismembered hand (complete with watch and tree rings? It gets weirder the more you look at it…) interacting with a cartoon version of Hootsuite’s interface. Nonetheless, it mirrors the trend of using an illustrated version of the product instead of a screenshot, and conveying interaction with characters. Whatever your personal design preferences are, it’s clear that the SaaS world has been heavily influenced by illustration in 2018. I don’t know how long this trend will last, and what might replace it, but I do think that the whimsical and sometimes intricate designs go a long way towards humanizing software products and conveying a user-centric approach (with perhaps the exception of Hootsuite’s weird hand, which is conjuring up a lot of images of Thing from The Addams Family). At the end of the day, it’s people who use your website, people that buy your products online and people who will help you succeed in online business. So it’s not too crazy of an idea to have some images of them on your website. Even if they are cartoons.